In this this lesson I am going to explain how to install WordPress on Ubuntu Server 16.04 with Apache as the Web server. For this guide, we are going to use www.example.com as our Domain name. To use the example.com domain, we need to add a host record to the hosts file in our personal computer. In Linux and Unix hosts file is '/etc/hosts', In Microsoft Windows hosts file is 'C:\Windows\System32\drivers\etc\hosts'. Following are the steps you need to follow in order to Install WordPress on Ubuntu Server 16.04. Install Lamp Stack on Ubuntu Server. Create MySQL Database and MySQL User. Create WordPress Main configuration File. Following sets of command will Install Apache, MySQL and PHP on your Ubuntu Server 16.04. Next, we need to create MySQL Database and User account for the WordPress. WordPress needs MySQL Database and MySQL user who has privileges to the Database. You can easily create the Database and User from the phpMyAdmin. I will show how it is done from the MySQL Console. I will create a Database called "ubuntu_wordpress" and user called 'wp_user' with 'wppass' as the Password. 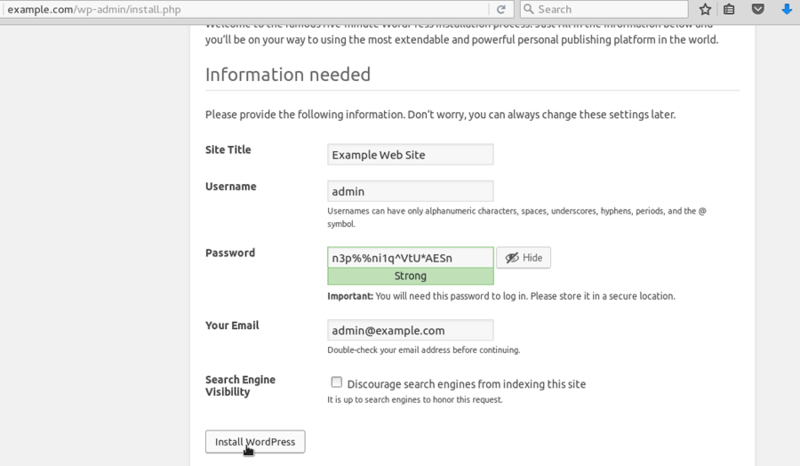 This will extract WordPress to the /var/www/ directory. Inside the '/var/www/' directory, you should have a new folder called wordpress. We will rename the folder to 'example.com'. This is going to be the DocumentRoot of our Website. Main configuration file of the WordPress is 'wp-config.php' file. There is a sample file called wp-config-sample.php in the example.com folder. Rename it to 'wp-config.php'. Now let's create the Apache Virtual Host for the our example.com domain name. Open the example.conf file and add following Virtual Host Configuration. Now open the Web Browser and type your domain name on the address bar, you will get WordPress Installation page. In the Installation page, provide the information as requested and Click on the 'Install WordPress' Button to Finish Ubuntu WordPress Installation. To go to admin page type 'domain-name/wp-admin'. To change the WordPress permalink structure, rewrite Apache module needs to enable in the Ubuntu Server. To access files on the Web Server, we need to configure FTP Server on Ubuntu. You can read following article to learn how to setup FTP Server on Ubuntu Linux. After configuring FTP, Create new user with website Document Root as user home directory. To log into the Server you can use a FTP client like FileZilla. File permission Mode 2755 will give write permission to the owner and read permission to the group.